As special counsel Robert Mueller’s investigation of Russian election interference gets closer to President Donald Trump, he is shaking up his defense team. Fox News reports  that as part of an ongoing shakeup that included the departure  of lead lawyer John Dowd, the president’s legal team is adding Victoria Toensing. Toensing joins a group that includes her husband, Joseph diGenova, hired earlier in the week, and Jay Sekulow. All three share a common theme: Each was hired after making regular appearances on Fox News in which they vigorously defended the president and attacked the Russia probe. This is the legal team Fox News host Sean Hannity built. As Fox has remade itself as a pro-Trump propaganda machine , working to delegitimize Mueller’s probe and defend the president on all counts, the network has brought on several lawyers who try to put a legal gloss on its tactics. These figures are especially prevalent on Hannity’s program, which has led the charge  in denouncing the special counsel. Trump appears to be tearing down his legal team and reassembling it with lawyers pulled from the Fox greenroom. Sekulow, a longtime fixture on right-wing TV who joined Trump’s team in June, was reportedly hired  to serve as “the omnipresent TV face of Trump's defense” because the president liked the way that Sekulow, who had characterized  the president as the victim of a “deep state bureaucracy” and a “shadow government,” defended Trump in cable news appearances. 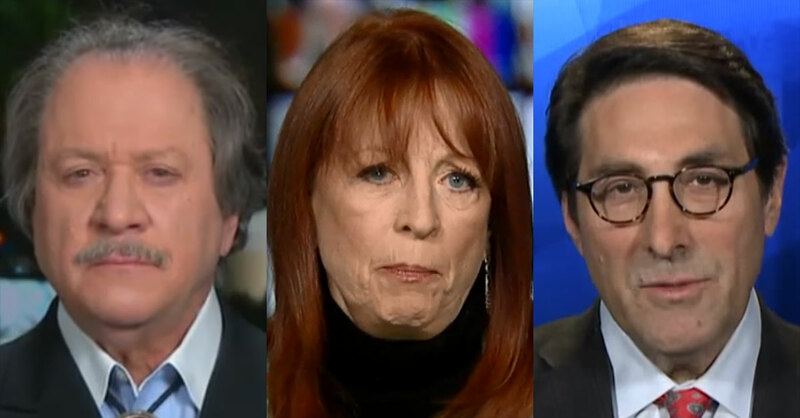 Toensing and diGenova probably have their jobs for the same reason -- both are conservative activists  who regularly use Fox appearances to offer a staunch defense of the president and lash out at the president’s investigators in ways that mirror Trump’s own attacks on the FBI and special counsel. (Toensing has made at least 21 appearances on the network since mid-October, while diGenova has appeared at least 12 times over the same period, according to Media Matters data.) DiGenova has argued  that Trump was framed by FBI officials and the Justice Department while Toensing has called for  the appointment of a second special counsel to investigate Mueller himself. Adding them to the team may signal that the president wants his lawyers to engage in a scorched-earth offensive. Trump, who watches hours of cable news each day, has long had an affinity  for television personalities, with several playing key roles  as campaign advisers or joining the administration  after his inauguration. Trump’s legal team shakeup is part of a broader pattern, in which Trump is becoming increasingly confident  in his role, removing senior staff he believes were thrust upon him, and bringing in more cable news personalities . National Economic Council Director Gary Cohn and national security adviser H.R. McMaster have been replaced by CNBC contributor Larry Kudlow and Fox News contributor John Bolton, whose TV hits the president reportedly enjoys , with Fox host Pete Hegseth reportedly  a leading contender to replace Veterans Affairs Secretary David Shulkin. Some of the president’s key outside advisers are also cable news propagandists whose programs Trump regularly watches. These include Fox’s Jeanine Pirro , who was reportedly interviewed  for deputy attorney general during the transition and blasted Attorney General Jeff Sessions during an Oval Office meeting with Trump and top White House staff last year; Fox contributor Newt Gingrich , who was reportedly a finalist to be Trump’s running mate; and Hannity, with whom the president regularly consults . Notably, Hannity has previously retained  both Sekulow and diGenova as his personal lawyers. Trump may think that filling his legal team with cable news personalities is a great idea, but it has one clear downside. Sekulow has  “virtually no experience in law enforcement investigations or white-collar matters,” diGenova  “is not expected to take a lead role” but instead to “serve as an outspoken player for the president,” and Toensing’s addition  is seen as “a sign that Trump wants to flip the script and investigate his investigators.” Who is going to do the actual work of defending the president as the Mueller investigation takes the debate from the greenroom to the courtroom?